Catholic Social Services of Washtenaw County (CSSW) is proud to announce the renewal of an annual $15,000 grant from the Ann Arbor Area Community Foundation’s Anna Botsford Fach Fund to support CSSW’s capacity to help older adults remain independent and in their home for as long as possible. CSSW has community based programs to aid the 55 and better population, from illness and care giving to needing basic household repairs or tax assistance. Through volunteers, staff and collaborations with the community, we are able to facilitate several programs to provide respite, activities, tax assistance and so much more for seniors. 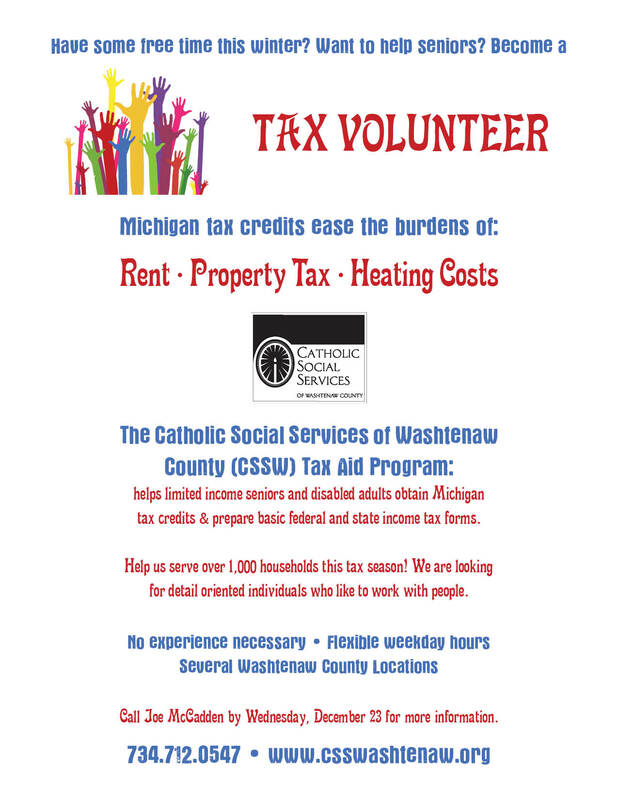 For more information on the senior services provided by CSSW, please visit www.csswashtenaw.org. Hosted by the Michigan Department of Health and Human Services. For questions, please contact Mike Bobbitt at BobbittM@michigan.gov or 517.335.6388.
Who Should Attend: Criminal justice professionals, law enforcement, judges, prosecutors, probation officers, domestic violence advocates, healthcare providers, substance abuse providers, mental health providers, batterer intervention service providers, and other social service providers who work with children, victims and perpetrators of domestic violence. What Will The Training Cover: Over the next 18 months Michigan’s state and private child welfare workers will learn and implement a new approach to promote the safety and well being of children who are harmed by and adversely impacted by domestic violence perpetrators. This initiative is called the MiTEAM Domestic Violence Enhancement. Your work on behalf of families and children who are affected by domestic violence distinguishes you as an important partner in this training. Therefore, we ask you to join us on October 30th to learn about the MiTEAM Domestic Violence Enhancement as well as our efforts to improve our community collaboration. Understanding domestic violence through a perpetrator pattern based approach, including the role of substance abuse, mental health, culture and other socioeconomic factors. Recognizing how perpetrator’s actions harm children and impact well being. Identifying the non-offending parent’s strengths, including actions and strategies that protect children. Shop items for your children at affordable prices! Tables available for $20 each. Do you have new or gently used baby/child items you would like to donate? Items can be dropped off on Friday, May 20 betweeen 12-5 pm, or contact Talia at tanderson@csswashtenaw.org or 734.926.0158 to schedule a drop off time. All donations will go toward the Family Time Program. FREE ADMISSION to anyone bringing three non-perishable items for the CSSW Food Bank. Have some free time this winter? Want to help seniors? tax credits & prepare basic federal and state income tax forms. Help us serve over 1,000 households this tax season! We are looking for detail oriented individuals who like to work with people. Call Joe at 734.712.0547 with questions or to sign up.